Folpetto, stylish Italian swimwear for carefree summer days! Folpetto is a swimwear brand created by two Italian mamas with a vision. Being childhood friends, Camilla and Dunia share fond memories of long and magical days on the beach. When they became mothers, they wanted a similar experience for their children: endless family fun on the beach without a worry in the world! Of course they wanted them to be sun-safe too, and (Italian as they are!) look stylishly dressed at the same time. When after a long search they couldn’t find any swimwear brand that matched their high standards, Folpetto was born. The Folpetto collection is made from high-quality and eco-friendly materials. The fabric is recycled from regenerated fishnets!! It offers an excellent sun protection (UPF 50+), blocking over 99.8% of harmful sun rays. Even though the fabric is ultra thin (so that it dries very quickly), it is still strong and durable. Folpetto swimwear will last through years! I love the fun and playful designs of the collection. The pretty, deep colours and fun prins are so lovely and the designs are modest yet playful and original. And how cute are the ruffles?! 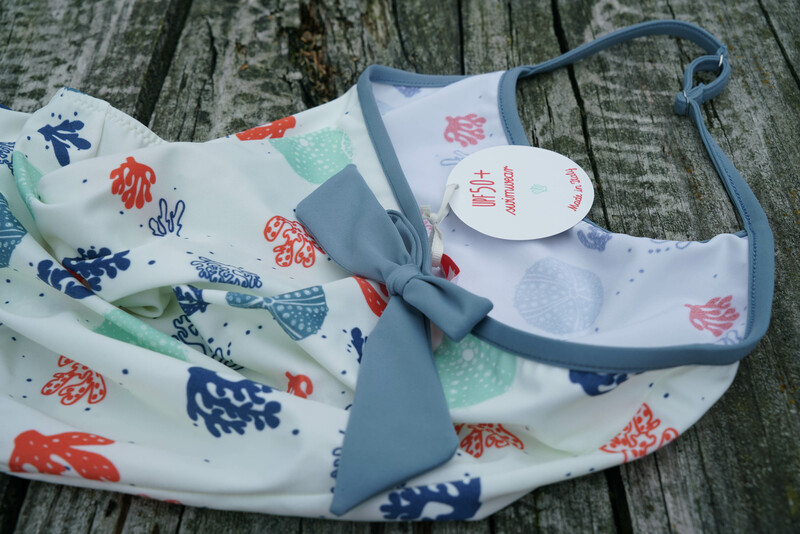 My kids love their Folpetto pieces — because they are so very soft and breathable, they are super comfortable to wear! (Casper wants to wear his ‘swim shirt’ all the time!) I also like the fact that the fabric is chlorine resistant as well as resistant to suntan creams and lotions. So no nasty stains or discolouring! All manufacturing takes place at a small family firm in Italy, where they have decades of experience and they still produce each item individually with passion and care. In the photos above, Ava is wearing the Olivia one piece as well as the Penelope one piece (which does run small, so make sure to order a size up if you can!). Casper is wearing the swim short Tomasso in blue and with the fun coral print, matching Ava’s one piece. Oh, and his favourite swim shirt, of course — the Leonardo rash guard! PS This article is sponsored by Folpetto, a brand we love and a member of our shopping portal. As always, all products have been personally seen and tested by us and all words and opinions are our own. Thank you! Ava has such a wonderful smile–brightens up the day! The new Hatch collection and some photos from NYC!